Cunard's Queen Elizabeth arrives at the historic port of Southampton, England on October 8, 2010. Photo courtesy of Cunard. 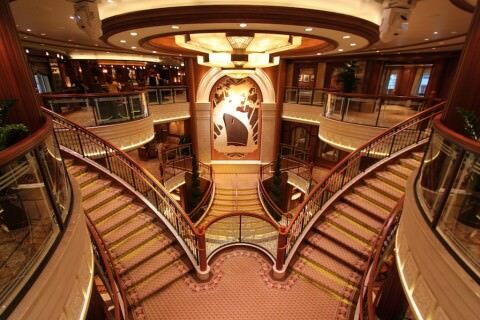 Cunard’s newest liner, the 92,000-ton, 2,092-passenger Queen Elizabeth debuted in mid-2010 (QE2 was retired in 2008) and boasts Cunard’s traditional black-and-red hull and grand interior spaces. 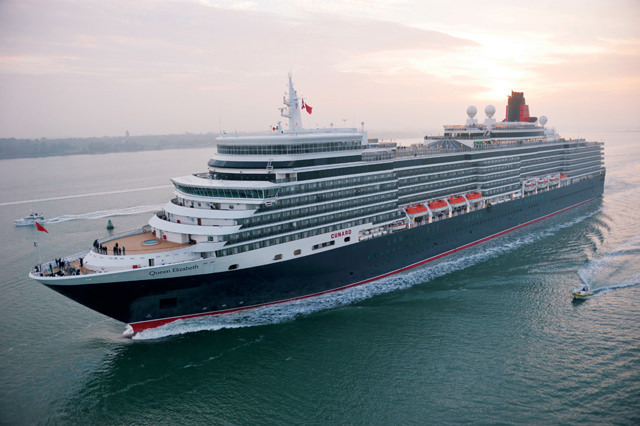 Along with near-sister Queen Victoria, Queen Elizabeth is a smaller, somewhat quieter version of the QM2. , though the ship successfully marries tradition with modern technology, design and innovation. 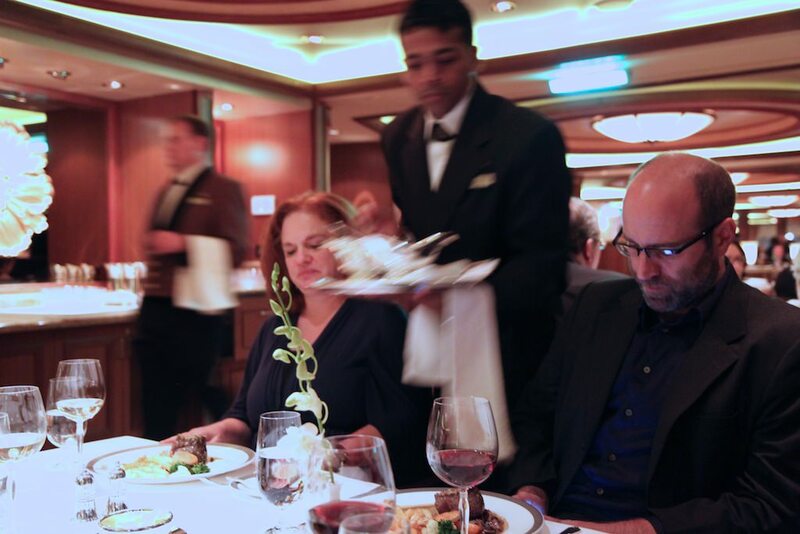 The Verandah Restaurant aboard Queen Elizabeth offers guests even more dining choices. Photo courtesy of Cunard. The ship’s class system means Queens Grill and Princess Grill diners have an exclusive restaurant, lounge and outdoor sunning areas reserved just for them. Like the QM2, Queen Elizabeth also has a casual lido buffet, plus the cozy and somewhat formal “Verandah” alternative venue for French cuisine ($20 for lunch and $35 for three-course dinner menu). The grand Britannia Restaurant is where the majority of guests dine, many of them after dinner moving on to the gorgeous Queens Room ballroom with inlaid wood floor. 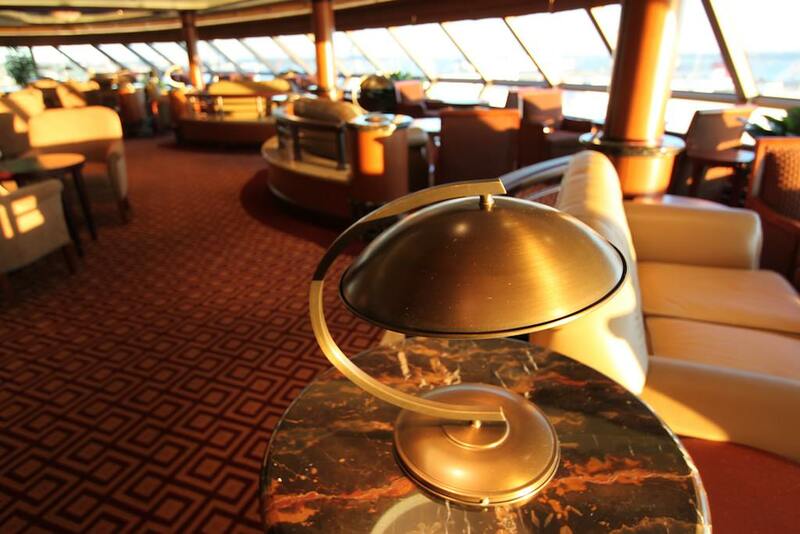 The many other lounges and pubs include the atmospheric bow-facing Commodore Lounge, nostalgic Midships Bar that pays tribute to the original QE2, and Golden Lion Pub. The library is among the best at sea and also guests always enjoy the ship’s permanent collections of Cunard and maritime photos and memorabilia. 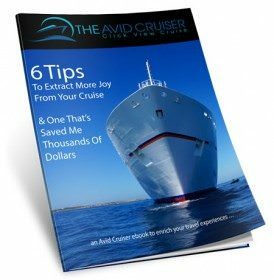 Want My Help With Your Cunard Cruise? Welcome Aboard! 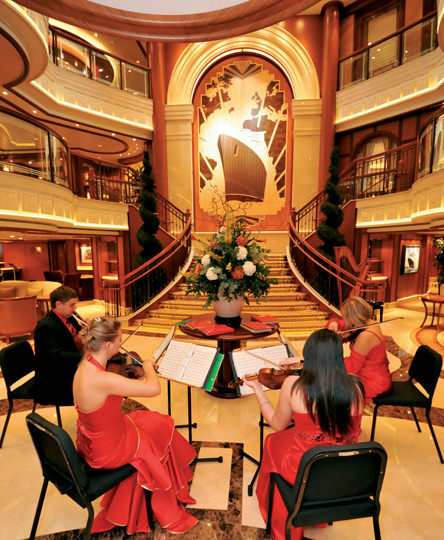 Classical music in the atrium onboard Queen Elizabeth. Photo courtesy of Cunard. You’ll find a forward-facing gym and spa, plus an indoor/outdoor play area for kids, several pools and hot tubs. Near the main pool is the lovely Garden Lounge, a conservatory-style space under a glass roof inspired by London’s Kew Gardens. Champagne and afternoon tea are served here by white gloved waiters, while evening it transforms into a supper club with live music and dancing. Outdoor activities include paddle tennis, quoits and golf putting, or a stroll around the expansive, wrap-around promenade deck. 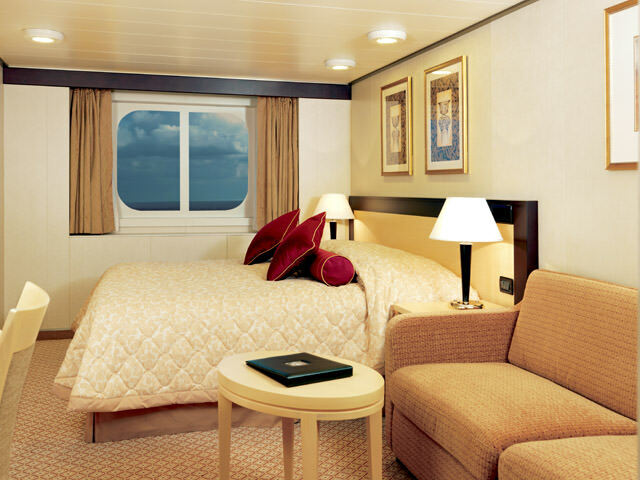 Staterooms range from insides and comfortable Ocean View rooms like the one shown above to full-blown suites. Photo courtesy of Cunard. Retiring to one’s cabin is always an appealing option as well. From inside cabins that range from 152 to 207 square feet to outsides running 180 to 197 square feet and 11 categories of suites and penthouses, rooms are stylishly decorated and they all have at least a mini-fridge, bathrobe, slippers, American and British electrical outlets, dataport outlet and a half-bottle of sparkling wine waiting on the first day of the cruise. Grills suites guests are privy to even more of course, from a pillow menu to concierge service, shoe shine service, a separate bath and shower, a larger sitting area, and a full bottle of sparkling wine upon embarkation. Queens Grill guests are on the receiving end of complimentary daily canapés, fruit basket, butler service, and sugar-iced strawberries to go along with a bottle of champagne upon embarkation. Like the Queens before her, Queen Elizabeth evokes elements of Art Deco. Tradition reigns at Cunard Line, and that is why the entirety of the Queen Elizabeth is a nod to the company’s former liners. Queen Elizabeth’s art deco design was inspired by the line’s first two Queens, the 1930s-built Queen Elizabeth and Queen Mary. First impressions matter, and Queen Elizabeth impresses as soon as guests embark into the ship’s triple height Grand Lobby, the ship's social hub, which showcases her grandeur and links her with ocean liners of the past. In the Grand Lobby, a stunning art deco chandelier comes from the era of the first Queen Elizabeth. 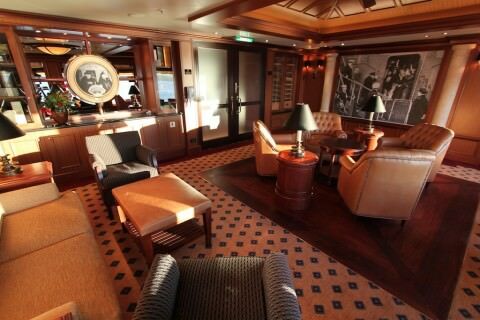 The new Queen also has a Midship’s Bar, a throwback to the first Queen Elizabeth, and home to three cases of memorabilia related to the original liner, including a 1938 invoice from the shipbuilder and an original ship telephone. QE2 fans will be pleased to know that some of the best relics from that vessel are also on display here, such as the QE2’s bell and a bust of Queen Elizabeth that was in the QE2’s Queens Room. Also bowing to early history, the new Queen did away with the Todd English restaurant that both the Queen Mary 2 and Queen Victoria have. On Queen Elizabeth, Cunard re-introduced a specialty restaurant from the first Queens, The Verandah. Run by Jean-Marie Zimmermann, a longtime Cunard chef, the space pays tribute to its predecessor with identical art and original menus on display from their Verandah restaurants. 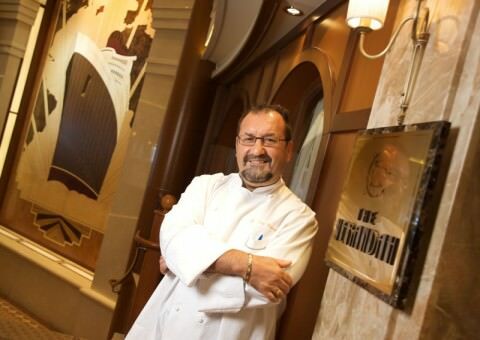 Jean-Marie Zimmermann, a longtime Cunard chef, runs The Verandah, a specialty restaurant from the first Queens. The Queens Grill and Princess Grill offer upscale dining and service. Where Queen Elizabeth does have continuity with her sister ships is in the dining. As on Queen Mary 2 and Queen Victoria, each category of stateroom is paired with a sea-view restaurant. The restaurants follow a similar pattern to Queen Mary 2 and Queen Victoria, with Queens Grill and Princess Grill Restaurants for those guests in Grills suites, and the Britannia Restaurant for the deluxe stateroom accommodations. Like Queen Mary 2, Queen Elizabeth also offers the Britannia Club where guests travelling in AA category staterooms enjoy single-seating dining at a time of their choosing in a sea-view dining room. 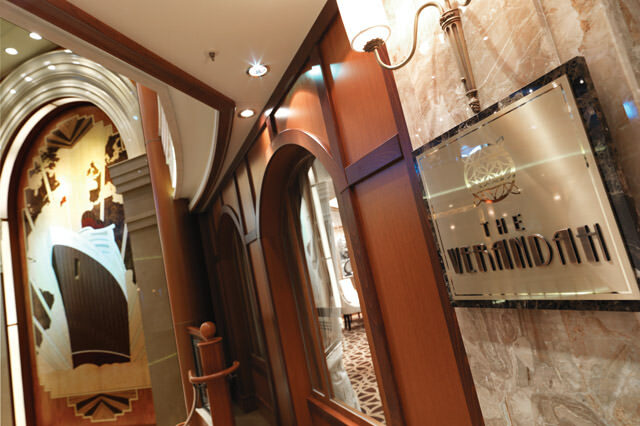 The main dining room, the Britannia Restaurant spans wo decks at the stern of the vessel and evokes memories of classic ocean liner restaurants with a sweeping staircase and marbleised backlit decorative ceiling among the focal points. Breakfast and lunch are served by open seating, and guests have the option of either early or late sitting for dinner. Both the Queens Grill and Princess Grill Restaurants are located on top of the ship (Deck 11), enclosed by graceful and gently curving panoramic glass walls on the seaboard sides, and cantilevered out over the side of the vessel above Deck 10. Both Grills offer a single seating, so guests can enter at a time of their choosing, and the restaurants themselves, although architecturally similar, are decorated distinctly to create an individual feel. Grills guests also have exclusive use of their own private bar and lounge conveniently located next to the Grills restaurants, and complete with resident Concierge. French–style doors open from each Grill Restaurant onto the Courtyard – an exclusive patio area, where al fresco dining is offered, and steps lead up to the Grills Terrace – a secluded retreat that’s on the ship’s uppermost deck where Grills guests can enjoy luxurious sunbeds and dedicated waiter service. The Garden Lounge, also named after a room on the first Queen Elizabeth, hosts occasional evening “Supper Clubs” with musical entertainment and dancing. The area has a palm–filled conservatory feel inspired by the glass houses at Kew Gardens and its vaulted glass ceiling makes it a truly light, bright and airy place to sit by day. The Lido Restaurants, up on Deck 9, are light spacious areas with sea views, and offer breakfast and lunch buffet style. In the evenings two of the restaurants serve different styles of regional cuisine, in a more formal setting, and the third continues to offer an extensive buffet. Café Carinthia was introduced on Queen Victoria – furnished in art deco touches and rich décor, and offering sweet pastries, fine teas and coffees. Golden Lion Pub, another Cunard signature, offers English pub food for lunch in a traditional British pub setting. Roomy and priced right, Princess Suites range from 335 square feet to 531 square feet. 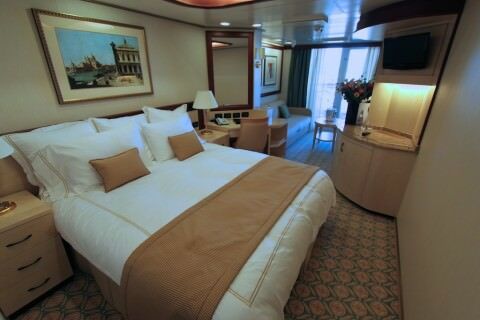 Queen Elizabeth offers 1046 staterooms, of which 892 (85%) are be outside staterooms with 738 (71%) featuring balconies. There are 127 Queens Grill and Princess Grill Suites on Queen Elizabeth, paired with dining in the Grills restaurants. The six main Queens Grill suites are named after the six Cunard Commodores who have been knighted: Commodore Sir Arthur Rostron, Commodore Sir Edgar Britten, Commodore Sir Ivan Thompson, Commodore Sir Cyril Illingworth; Commodore Sir James Bisset and Commodore Sir James Charles. Each suite features a portrait and biography of the Commodore after whom it is named. 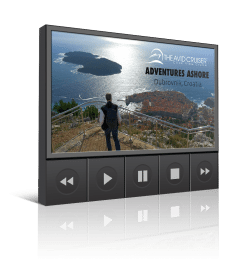 There are also nine different categories of suites and staterooms: Grand Suites, Master Suites, Penthouses, Queens Suites, Princess Suites, Britannia Club, Balcony, Outside and Inside.